I was having curry at a local Thai restaurant last weekend and it wasn’t so great, the so-called “Royal Curry” is similar to a peanut coconut curry, but it was way too sweet, and the consistency is too thick (they most likely used starch to thicken it). And I realized that overly-sweetness is actually a common theme in Thai food in Western countries, and after doing some research, the reason behind it is that for a dish like Thai Green Curry or Kaeng Khiao Wan (“Kaeng” meaning curry, “Khiao” meaning green, “Wan” meaning sweet), the sweet is usually understood too literally, when it actually meant to describe the particular color green of this curry, which is more like a cream green. 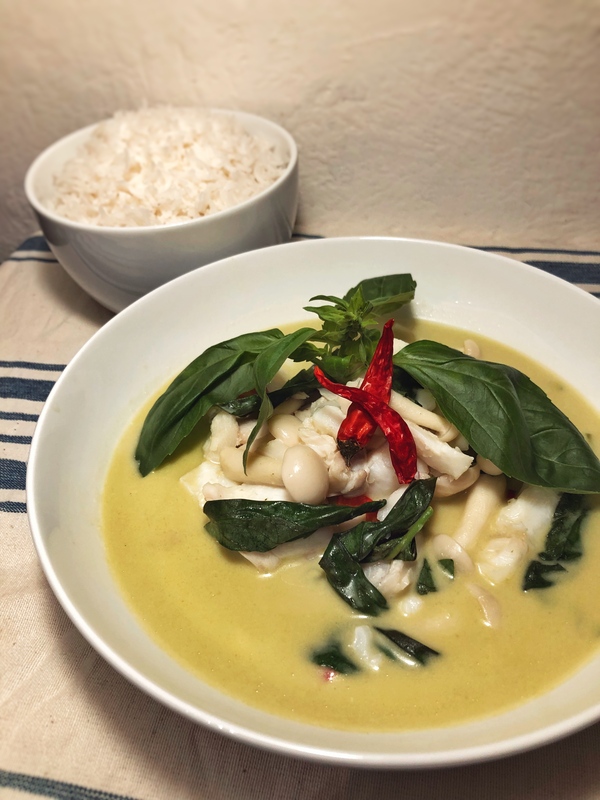 So, to make your Thai curry experience more authentic at home, we are going to make a pretty traditional Thai curry from Central Thailand, Kaeng Khiao Wan or Green Curry. Bring the seafood stock to a boil, then add all paste to the stock, cook for about 8 min or until it turns to a cream like color. At this step, you can either strain the stock and make a smooth curry, or keep the small bits in there and make a more rustic version of the dish. Add the mushroom and fish(or fishball) to the soup, pouch both until they are cooked, then add the coconut cream, mix gently so you don’t break apart the fish. Bring the curry to a boil and remove the mixture from the heat. Add the chopped red chilies and basil leaves, sever it with some rice, and enjoy! This is one of the easier Thai dishes, and take almost no time to cook, but it’s packed with amazing flavors and the freshness of the dish is unbelievable! The paste can be frozen into cubes and use in the future, and you can use almost any meat or mushroom or tofu you want, actually, Korean style fish cake is perfect for this dish. Give it a try, it’s really easy!